PANJIM: In what could be a major relief for liquor outlets in the cities, the Goa Legislative Assembly has passed the crucial Goa Highways (Amendment) Bill, 2017 classifying all the State highways within municipal limits into urban areas. The government had proposed amending the State Highways Act to provide relief to liquor vends located in the cities, through a bill introduced by PWD minister Ramakrishna 'Sudin' Dhavalikar seeking to amend Section 3 (i) and (iv) of the Goa Daman and Diu Highways Act 1974. During the discussion on the consideration and passing of the Bill on Monday, the Opposition benches sought to know whether government was intending to save liquor outlets that were forced to shut down following SC order banning sale of liquor on the highways. Legislator Luizinho Faleiro was among them asking the prolonged delay by the State government in approaching the SC to bring relief to the liquor owners. “The legal business has stopped and illegal business has started (after the SC order),” he alleged. 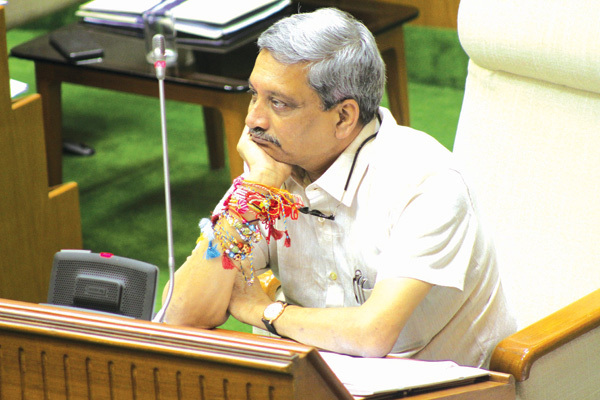 “Some states that approached the SC against the order have found the doors (of the court) permanently closed (for relief),” Parrikar said pointing that Goa cannot act in haste as it could prove a doom. The Goa Legislative Assembly unanimously passed The Goa Information Technology Development (Amendment) Bill, 2017 on the concluding day of the monsoon session of the Legislative Assembly on Monday. The Bill, introduced by IT Minister Rohan Khaunte, sought to define certain terms in the Act besides enabling implementation of the Information Technology Investment Policy with the changing dynamics of the IT and to remove the difficulties in implementation of the Act. The Goa Legislative Assembly on Monday passed the Goa Preservation of Trees (Amendment) Bill, 2017 which paves the way to declare Coconut Palm as the state tree. The amendment in this act gives the government the authority to declare Coconut palm as state tree. Replying on the discussion on the Goa Preservation of Trees (Amendment) Bill, 2017, Chief Minister Parrikar clarified even though matti, a forest tree, which is also a state tree it is not “officially” a state tree as the Act did not have provision for state tree. He said that the government for the first time is making such a provision or an act to declare a state tree. The Goa Requisition and Acquisition of Property Bill, 2017 has been referred to the Select Committee, headed by Revenue Minister Rohan Khaunte. The Bill had come up for consideration and passing on the concluding day of the monsoon session of the Legislative Assembly on Monday, but the Opposition sought clarity prompting the minister to announce forming a select committee. The House agreed for the Select Committee, which will also have seven members comprising of legislators Prolapsingh Rane, Felipe Neri Rodrigues, Aleixo Reginaldo Lourenco, Nilesh Cabral, Carlos Almeida, Prasad Gaonkar and Alina Saldanha. In the backdrop of the Goa government proposing formulating Transfer of Development Rights (TDR) policy, The Goa Town and Country Planning Act was amended creating independent Chief Town Planners for the Land Use, Planning and Administration purpose respectively. The Goa Town and Country Planning (Amendment) Bill, 2017 was introduced and passed on the concluding day of the monsoon session of the legislative assembly after a brief discussion. In the statement of objections and reasons, the Bill mentions that in the last 43 years the State witnessed increase in infrastructural projects, in multiple increase in development, land use on account of various factors like increase in tourism, improved standard of living and nuclear families, etc. The Legislative Assembly on Monday passed the Goa Appropriation Bill (No 3) 2017 designating Rs 990 crore as supplementary grants to the government for the fiscal year 2017-18. The appropriation bill authorises payment and appropriation of certain sums from and out of the consolidated fund for the State of Goa for the services and purposes for the financial year 2017-18. Further the Legislative Assembly also passed the Goa Appropriation Bill (No 2) 2017 that authorised the payment and appropriation of Rs 16,027.01 crore from the consolidated fund for various departments for the financial year 2017-18. The Legislative Assembly on Monday passed the Goa Compensation to the Project Affected Persons and Vesting of Land in the Government Bill, 2017 with majority after much criticism from the opposition. During the discussion on the Goa Compensation to the Project affected Persons and Vesting of Land in the Government Bill, 2017, the opposition MLAs demanded that the Bill should be referred to the select committee. However, Chief Minister Manohar Parrikar along with Minister for Revenue Rohan Khaunte refused to the refer the bill to the select committee clarifying that this bill is brought for passing to safeguard the interest of the government. Congress MLA's Digambar Kamat, Alexio Reginaldo and Luizinho Faleiro stood firm demanding that this bill should be referred to the select committee and upon that maybe passed in the next session of the Assembly. Faleiro reiterated that these bills are serious and the government should not bulldoze the legislations.